Following a successful and busy Day 1, we began Day 2 with another media interview to talk about Mississauga and the reason for our mission. 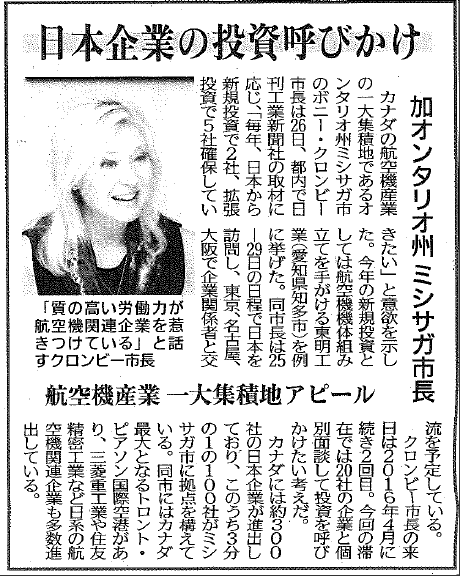 Nikkan Kogyo Shimbun (“Mississauga – An aerospace cluster in Canada with good security, well-developed infrastructure”). 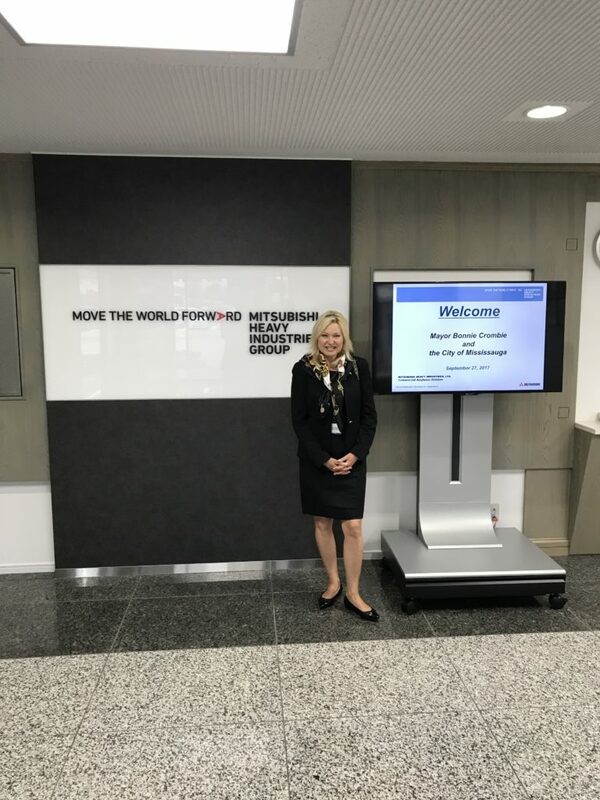 I will continue to post articles as they become available, but these articles are an accurate representation of the reception Mississauga is receiving in Japan. Following our media interview, we boarded the Shinkansen or “bullet train” to Nagoya, Japan to prepare for the Aeromart Conference. 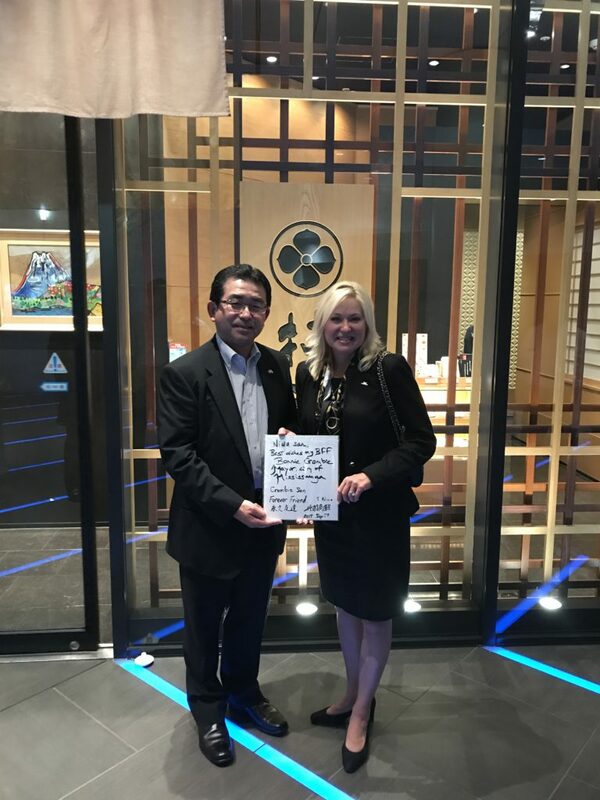 Upon arriving in Nagoya, I again sat down for a media interview, this time with Chubu Keizai Shimbun (“Mississauga Mayor calls for Japanese companies’ investment; Stresses the Ontario city’s feature as large aerospace cluster in”). 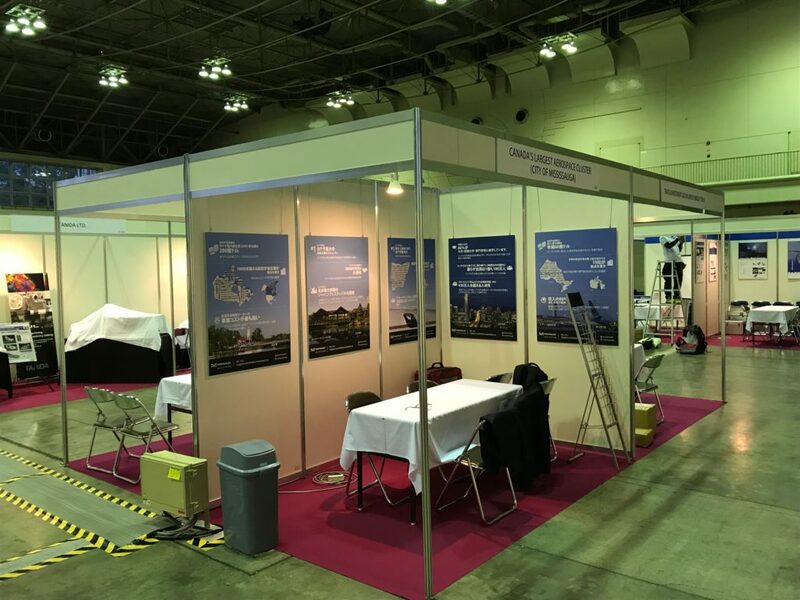 The main reason for Mississauga to come to Japan this time was to take part in the Aeromart Nagoya Trade Event. 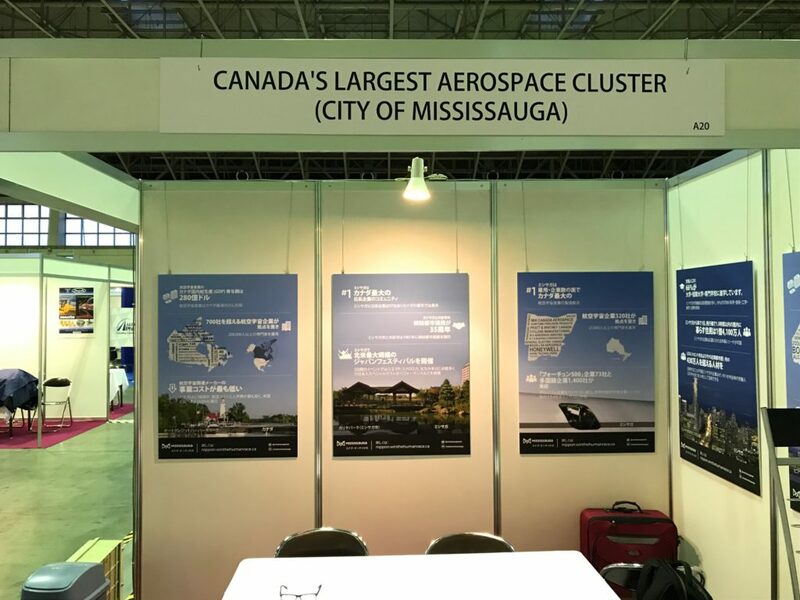 On Day 2, we set up our City of Mississauga booth which is titled “Canada’s Largest Aerospace Cluster (City of Mississauga).” This is an apt description and has caught the attention of many at the Aeromart event. I took the opportunity to walk the conference floor. Along the way I met Daniel Dobrjanski and Robert Sochaj of Cyclone Manufacturing Inc., a Mississauga-based aerospace success story. 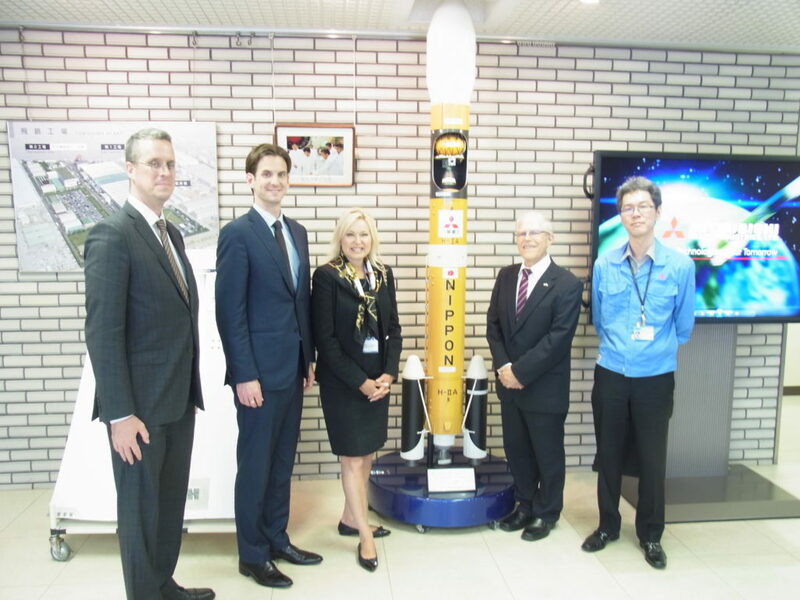 Located in the Meadowvale area, Cyclone is part of Mississauga’s aerospace ecosystem, working with many local companies, including Mitsubishi Heavy Industries Canada Aerospace (MHICA), as well as customers around the Globe. They are known for their commitment to excellence and elite quality work. 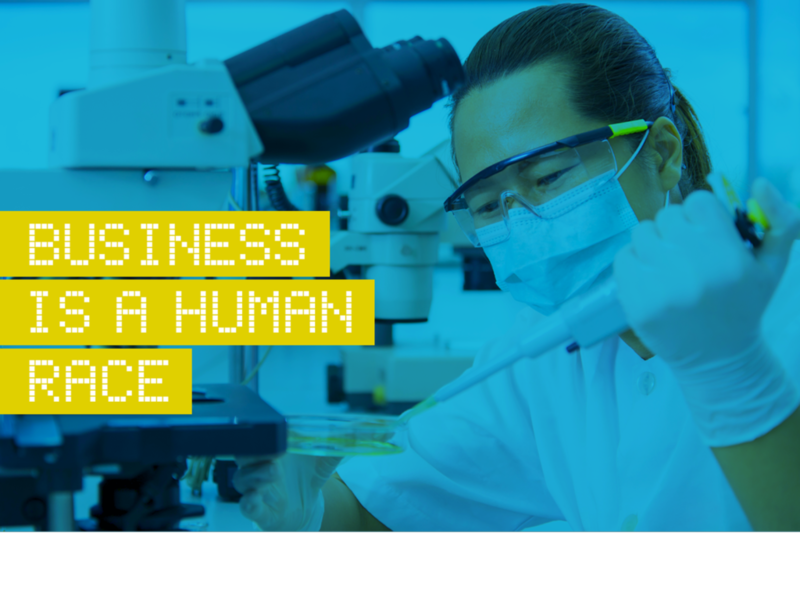 Employing over 650 people at their Mississauga location, they are a strong corporate partner. Photo caption: With Daniel Dobrjanski and Robert Sochaj of Cyclone Manufacturing Inc. 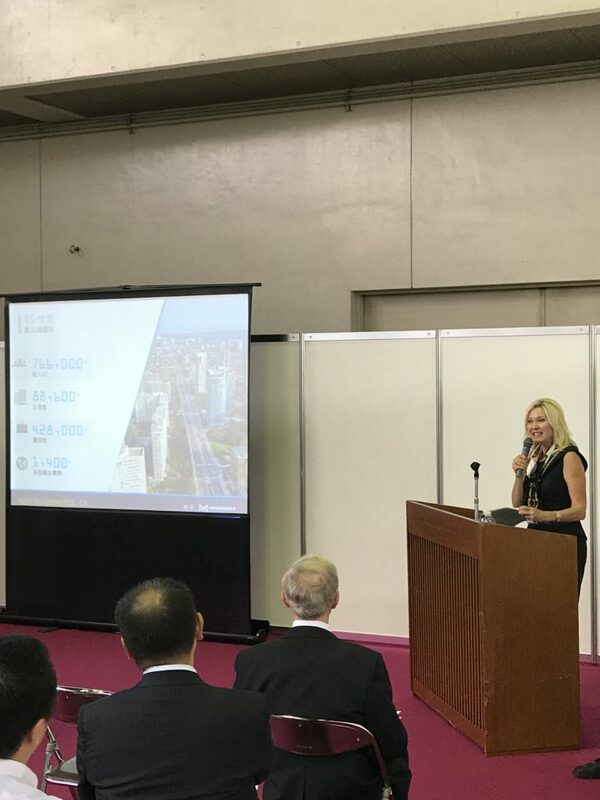 I also had the opportunity to speak with members of Mie Prefecture (province), home to many Japanese aerospace companies. 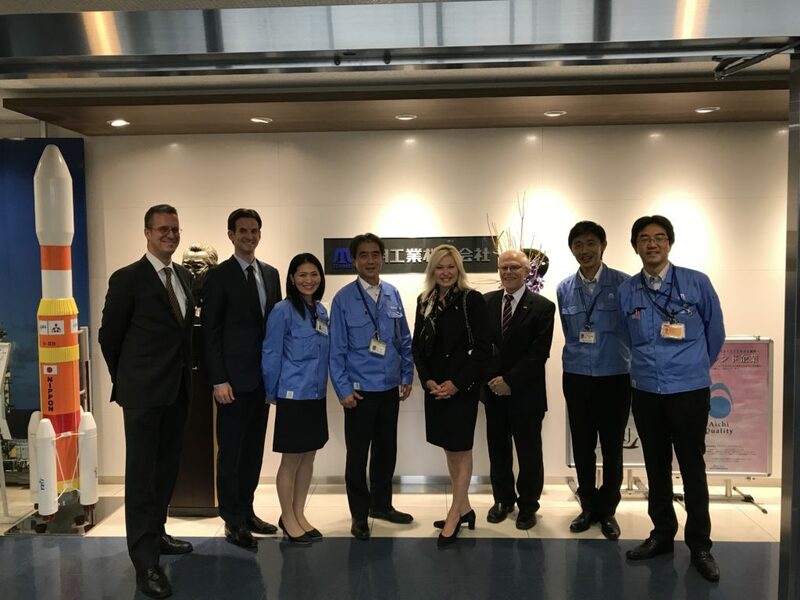 Earlier this month the City of Mississauga’s Economic Development Office welcomed a delegation from Mie Prefecture to discuss our aerospace cluster and why we have enjoyed so much success with Japanese companies. 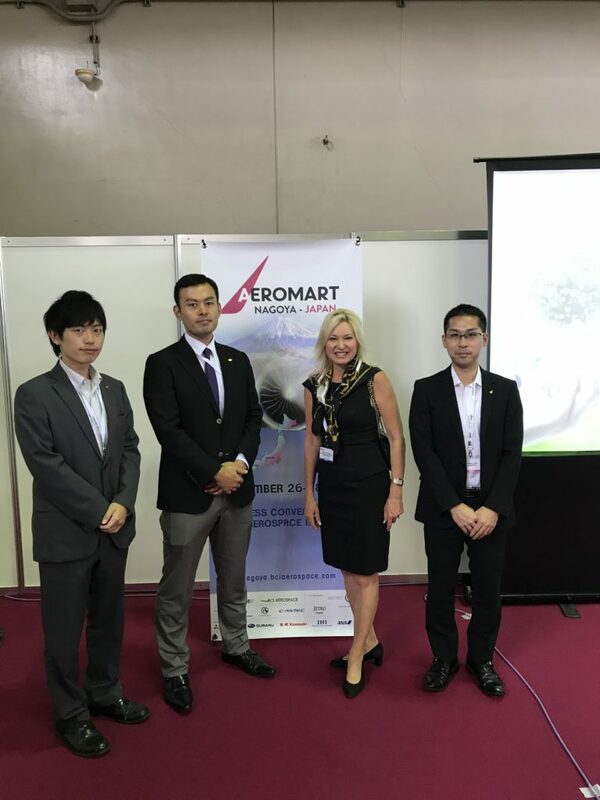 The Aeromart trade event provided Mississauga not only an opportunity to have a booth and engage in many business to business (B2B) meetings, but also to speak to conference delegates about Mississauga and our aerospace cluster. 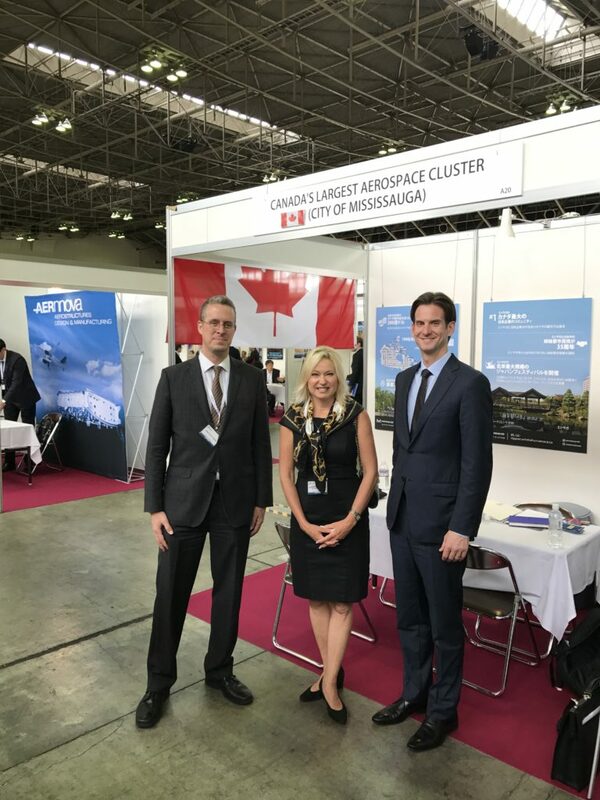 I was pleased to be joined by Chenier LaSalle, Consul and Senior Trade Commissioner for the Government of Canada in Nagoya, and David Perdue, International Representative, Government of Ontario International Office in Japan. Our three levels of government are working together to showcase Canada’s aerospace sector and the success Japanese aerospace companies have had in our country and more specifically, in Mississauga. Following presentations by Chenier and David about the benefits of Canada and Ontario respectively, I gave a presentation on Mississauga. 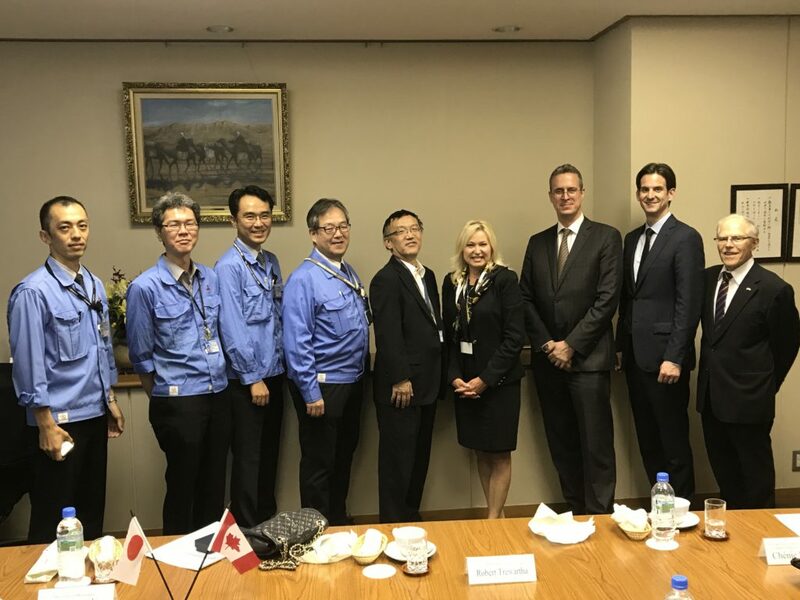 Having three levels of government working together demonstrates our collective commitment to Japanese aerospace companies and our willingness to work with them as they make Canada their home. Our presentation led with the following video about MHICA’s success in Canada, featuring CEO, Mike McCarthy. MHICA is one of the largest Japanese aerospace companies. 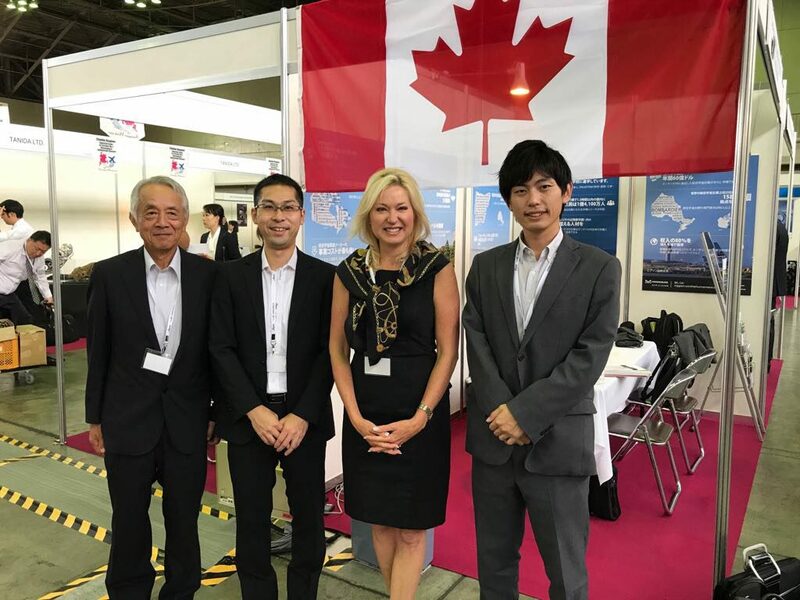 Their testimonial about their success in Mississauga sends a strong signal to the entire Japanese aerospace sector that our country, province, and city are excellent places to invest to be profitable. 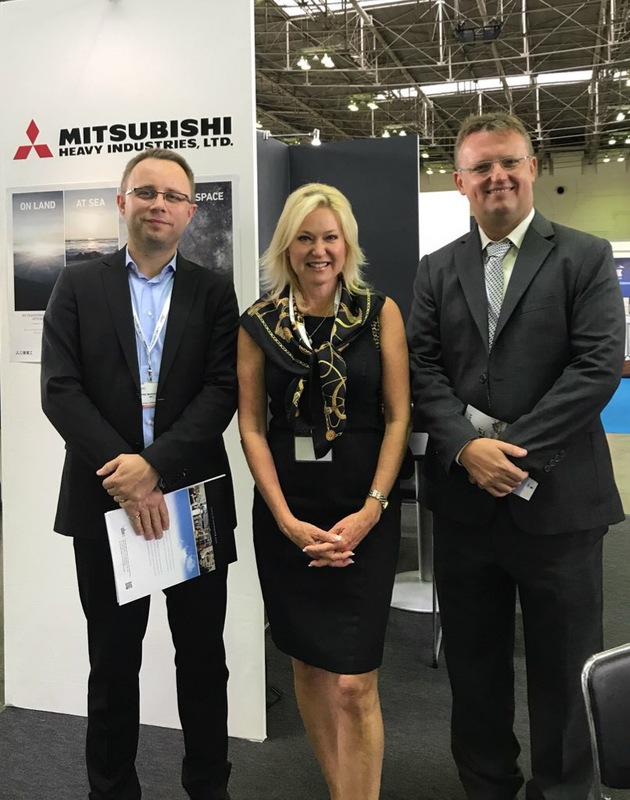 Many other Japanese aerospace companies work with MHI in Japan. To hear about the success of their Canadian subsidiary has sparked interest in how they achieved their success and the opportunities that Mississauga affords. Moreover, given the negative interest rate I referenced in my Day 1 post, our highly skilled talent and competitive corporate tax rate, as well as our high quality of life, Mississauga is an attractive destination for international expansion. Following our presentation to the Aeromart event, we travelled to meet with executives from MHI at their headquarters. We enjoyed a very positive and productive meeting wherein they spoke at length about their commitment to Mississauga and the many positive attributes of MHICA. In particular they spoke highly of our talented Canadian workers, as well as their commitment to a Kaizen culture that always strives for improving processes in manufacturing. MHICA has quickly become a source of pride for MHI and they are looking at ways to continue to grow MHICA in Mississauga. Following this meeting, MHI sent us on a tour of one of their manufacturing facilities where they build rockets and other space vehicles. For security reasons I cannot post photos inside the facility, but it was a highly impressive facility. This is not a tour that many people get to take. 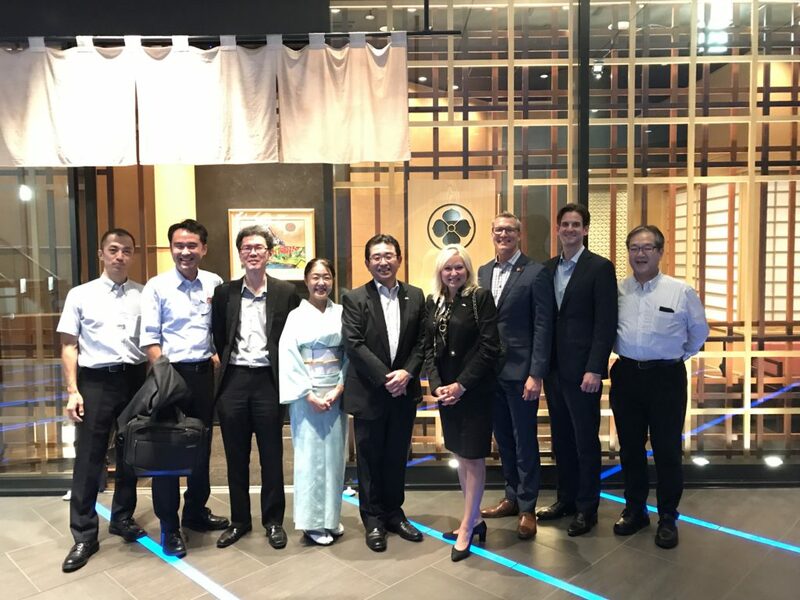 I also had the opportunity to join Mr. Takaoki Niwa, Senior VP and Senior General Manager (Commercial Airplanes Division, Commercial Aviation Systems, Head of Hiroshima Aviation Works), and his team for an authentic Japanese dinner to celebrate the success of MHICA. At this dinner, I was pleased to hear Mr. Niwa reiterate his affection for our city and his commitment to growing the MHICA business in Mississauga. In 2016, I met with Mr. Niwa’s predecessor, Mr. Hisano, who was also a strong supporter of MHICA and Mississauga. I was pleased to hear this commitment continues under Mr. Niwa’s leadership. I look forward to continuing to build upon this strong relationship. I also raised our partnership with MHICA and the work we did recently together to promote the MHI Canada Aerospace Structural Airplane Apprentice Program. MHICA’s Structural Airplane Apprentice Program is offered to people between the ages of 18-29. The training program lasts 20 weeks. Certified recruits undertake an 8 month apprenticeship. The program is ongoing with approximately 6 sessions held each year. Approximately 60 positions are available. Through our joint promotion, we were able to not only provide life changing opportunities to youth, but also help MHICA develop new talent to help them meet demands and grow. This is an example of Mississauga’s commitment to all businesses, in particular our aerospace companies. Photo Caption: With Mr. Niwa and MHI Team. Our day of meetings was rounded out with a visit to Tohmei. We first met with Tohmei in April 2016 on our last mission to Japan. They are very interested in Mississauga and the potential it has for their growing business. I look forward to hopefully making an exciting announcement with Tohmei in the near future. Day 2 and 3 in Nagoya have been very busy, but also very rewarding. There is a definite “buzz” about Mississauga at the Aeromart trade event, as well as in local media. This attention does not happen overnight; rather it is fostered over many years of commitment, hard work and relationship building. It also requires being targeted in our economic development efforts. Hazel McCallion began the work in Japan and I am pleased to carry it on. 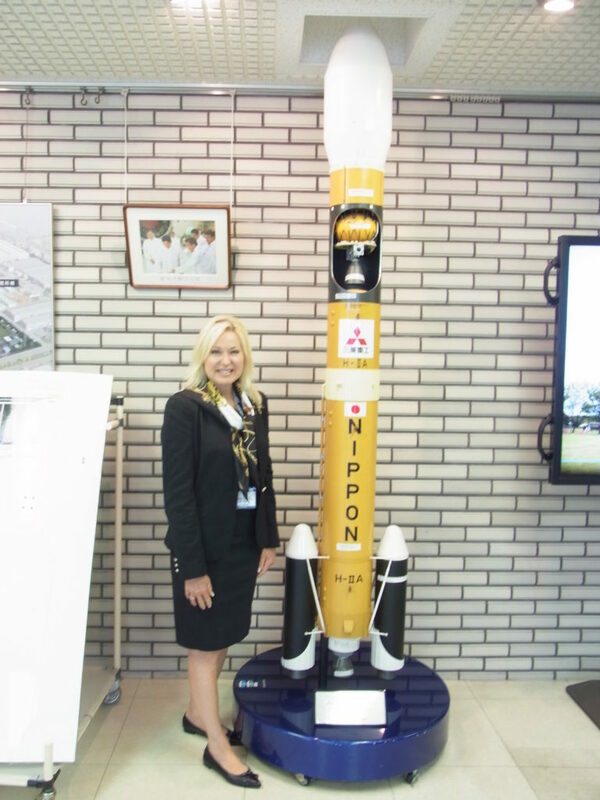 Mississauga has a strong and proud reputation in Japan, especially in the aerospace sector, thanks in large part to the focus and effort put into this market. As I’ve said many times, including most recently in the 2017 State of the City Address, Mississauga is in direct competition from jurisdictions around the world, as well as right here in Canada. Everyone is vying for these investments and the jobs and economic benefits they create. If Mississauga is not present globally, in a targeted and strategic way like we are in Japan, we will miss out on this investment. I believe my job as Mayor is to sell our city. If I don’t do it, who will? 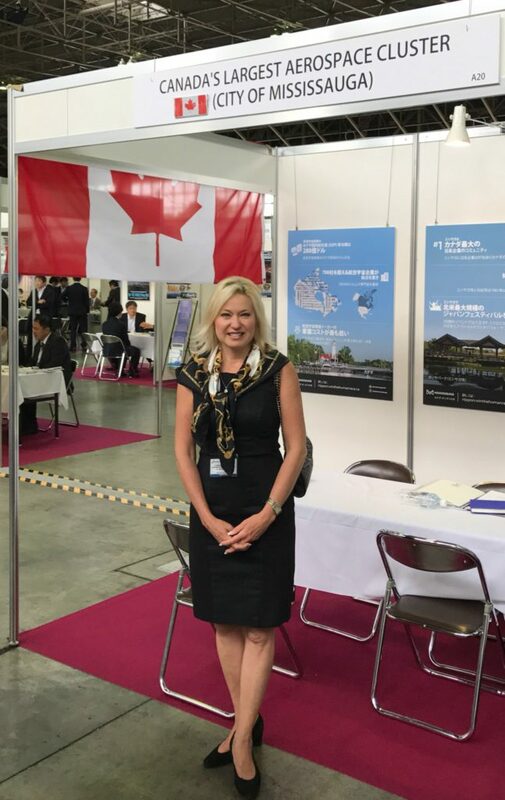 I look forward to Day 4 and 5 where I will meet with more Mississauga-based Japanese companies, and attend a Canada Chamber of Commerce dinner in Japan “Canada 150 Maple Leaf Gala” featuring many Japanese companies and even Princess Takamado of the Japanese Imperial Family.